[Go Back] [New Search] Details for Torii Kotondo (1900-1976) "Sash (Obi) - Version 2"
Description: "Obi" (Sash). This is the blue kimono/blue mica background version. 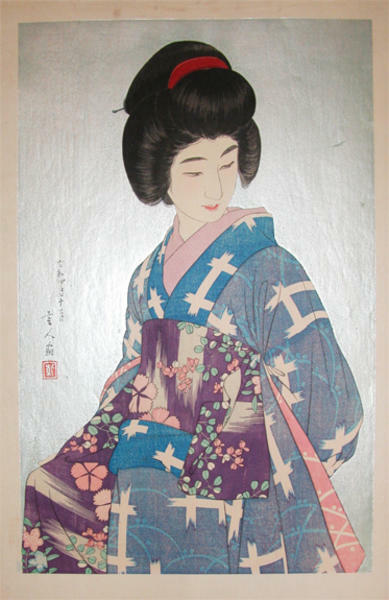 There is also a colour variant with a black kimono and cream mica background. A rarely seen beauty print by the Shin Hanga master Torii Kotondo. Edition size: 350. There is rumour that a 200-print edition also exists but I suspect not, given that I have not seen a single copy. Notes: Carver Ito. Printer Komatsu. The edition number in Japanese is on the verso.